Suggested airport for your arrival is the Boston Logan Int'l Airport (BOS). Your final documents will include the available transportation options to the hotel upon your arrival. A trip reception is included to give you a chance to meet and greet the host and the other travelers. The reception includes a meal and non-alcoholic beverages. Half day city tour to enjoy the sights and sounds that Boston has to offer. Visit the park where the Babe pitched, The Kid hit, Yaz dazzled and Ortiz thrilled young fans. Soak up the rich history and hear the echoes of the past. Visit the Green Monster, imagine being one of the "Knights of the Keyboard" as you see the view from the Press Box and visit the State Street Pavilion Club before strolling around Fenway Park. **Areas visited on the tour are accessible to all and are subject to change due to ballpark events. Tour lasts 45 minutes to one hour and includes visits to Monument Park, New York Yankees Museum, the Clubhouse/Batting Cage Area and the Dugout (areas visited are subject to availability). Half day city tour to enjoy the sights and sounds that New York City has to offer. The Liberty Bell in Philadelphia is a bell of great historic significance. The Liberty Bell is one of the most prominent symbols associated with the American Revolutionary War. The National Constitution Center, the World's only museum dedicated to the U.S. Constitution, is just 2 short blocks from the Liberty Bell. 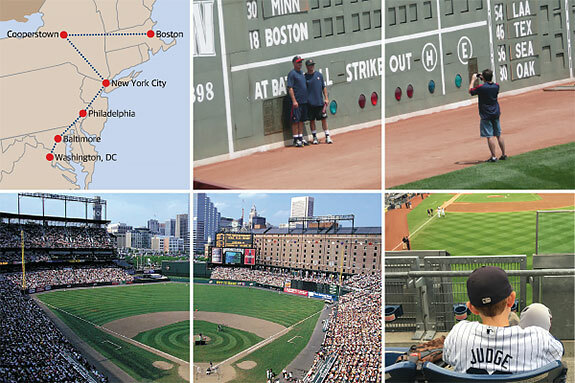 See Oriole Park at Camden Yards from a whole new perspective. Enjoy the charm of the ballpark from club level suites, the press level, and even the Orioles dugout. Take a Stroll Through The Ballpark That Forever Changed Baseball! (areas visited and tour are pending availability). Since opening in 1974, the Birthplace has served as a monument to the life and times of "The Babe". Tours include visits to the PNC Diamond Club and Delta Sky360 Club, a luxury suite, the Press Box: The Shirley Povich Media Center, the Nationals Dugout and many other Nationals Park attractions. Half day city tour to enjoy the sights and sounds that Washington DC has to offer. Suggested airport for your departure is the Ronald Regan Washington National Airport (DCA). Your final documents will include the available transportation options to the airport for your convenience. On Baseball Road Trips, we make frequent stops for everyone's comfort. We have a no smoking policy on all transportation provided. Our travelers receive a custom Passport to Baseball and a "stamp" for each ballpark visited. Once a fan visits all 30 ballparks with us, they are inducted into the Sports Travel and Tours Baseball Stadium Hall of Fame. Read more about this exclusive club on our Stadium Hall of Fame page. Per person based on occupancy.